Directions: From Rt 95. Take exit 2, onto 101 East. Very first exit off is route 27 towards Hampton. Come off the exit and bear right, to the stop sign and turn right onto Rt 27. Approximately a mile down on the right is Towle Farm Road. Turn right into Towle Farm and the complex is the second (2nd) left. The signs will say Riverwalk and Drakes Landing. There is a duck Pond on the right and a little market on the left. We are the next left. Parking Just a note about parking. This is a condo association and there is a rule against parking on the grass. Please find a spot in the lot or along side the road keeping your tires on the pavement. Thanks! On the agenda for this meeting: show and tell (bring all the projects you didn't bring last month! ), discussion of some upcoming activities for the end of this year and next, and member trunk shows by Mary and Joanne. Hope to see everyone there! 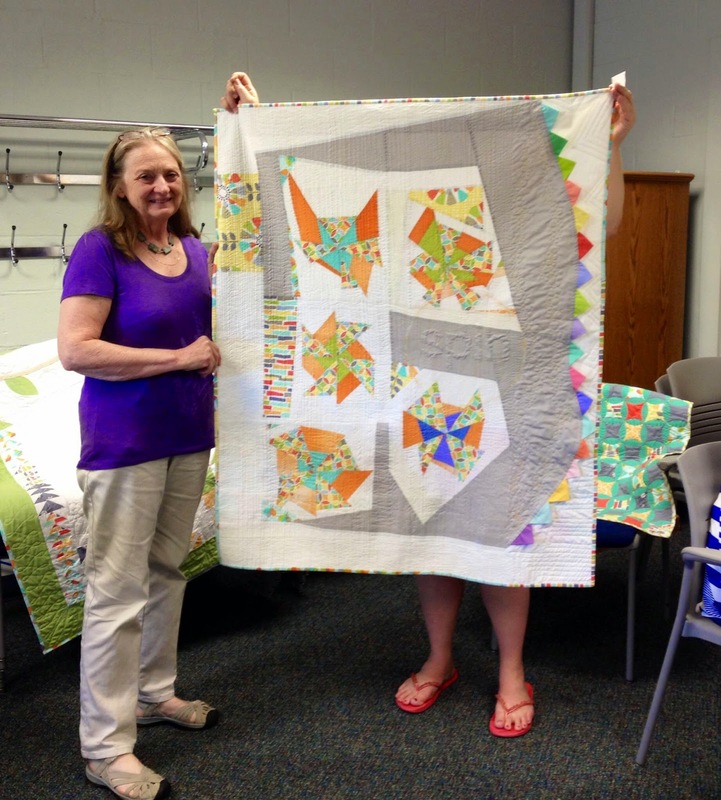 Our July meeting was held at the Stratham Public Library in Stratham, NH on July 12. We had a large and lively group in attendance, with many first-time visitors! Peg opened the meeting by discussing several business items. Our schedule of workshops and events for our regular meetings for the rest of the year has been planned. Please click the "Calendar" link at the top of the blog homepage to view meeting dates, locations, and a general idea of the plan for each meeting. Our guild has been asked to curate a large special exhibit for The Gathering quilt show in the fall of 2015. We will need committee members to volunteer to organize and curate the exhibit. If you would like to serve on this committee, please contact Peg soon. Officer nominations will take place at our October meeting (and voting will be at our November business meeting). Please think about whether you would like to serve as a member of the executive committee! Self-nominations are welcomed. :) A rotating leadership committee helps keep our group fresh and brings energy and new perspectives. Lottery block tutorial is here. (Make the 16'' size.) We're accepting these lottery blocks for two more meetings, August and September. Please bring $1 per block you make to buy an entry for the lottery. Please consider making a block! The more we make, the more someone will win. And these would be great blocks to win! Our regular show and tell was replaced by MQG Michael Miller fabric challenge voting; however, some special visitors shared mini quilts they had made. Mia and Elliot came with their mom Kerry to our meeting. 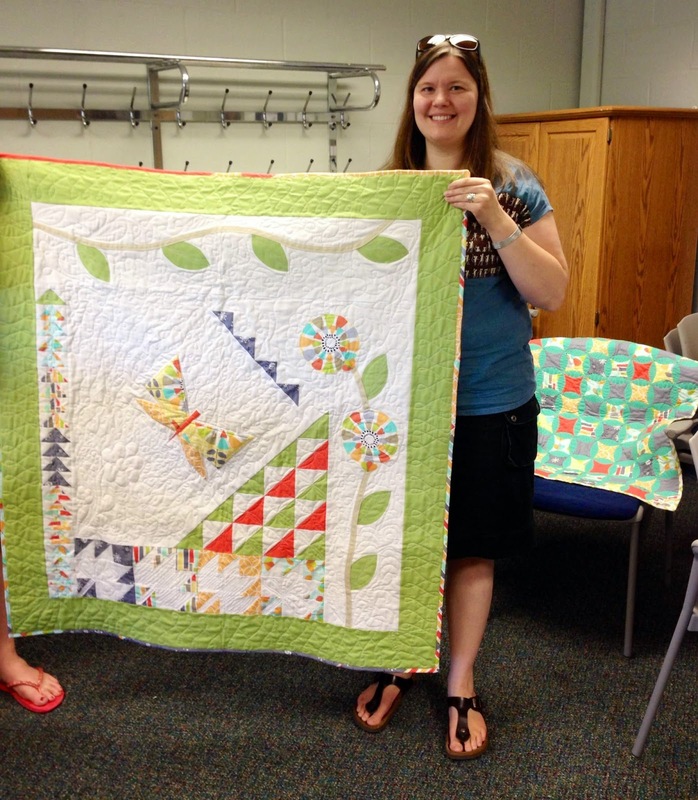 Their mini quilts are so bright and cheerful! 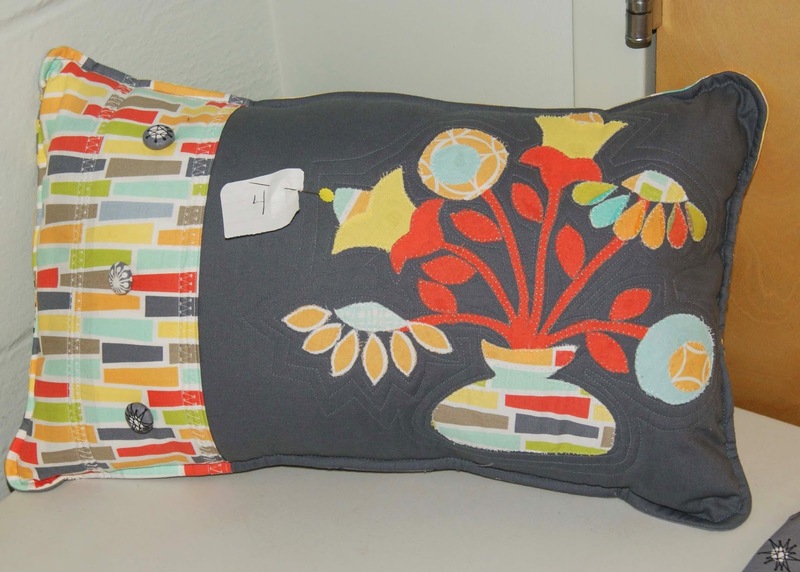 By popular vote, Judy was our Michael Miller fabric challenge winner! First-time visitor Kerry brought along a copy of her book to share with someone at our guild, so it became a third prize for our third-place winner, Jess! 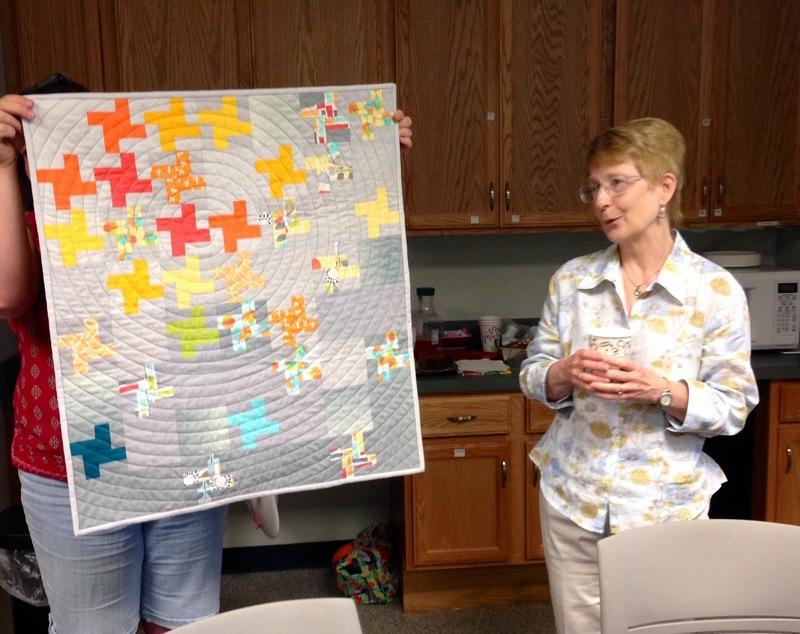 Amy then led the group in a workshop on machine-piecing 4'' clamshells. If you need access to her original tutorial for Sizzix, you can find it here. If you were at the meeting and are planning on finishing up your clamshells at home, she asked me to mention that using fusible fleece instead of batting would help to stabilize and flatten the curved piecing. 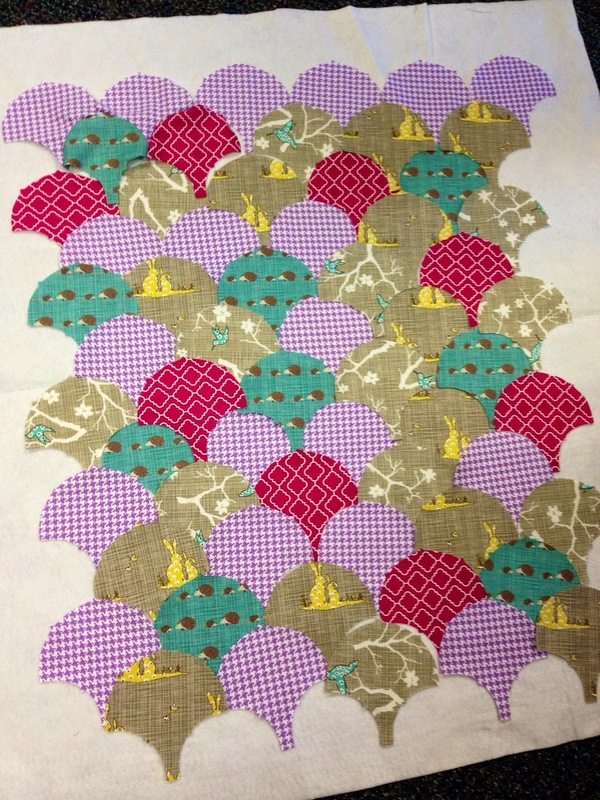 Instead of basting as usual, fuse the fleece to the wrong side of your piecing and then quilt. Our mext meeting will be held on August 2 from 10 am to 12 pm at the clubhouse of Riverwalk and Drake's Landing in Hampton, NH. Bring your show and tell and your oohs and ahhs--Joanne and Mary will be presenting trunk shows of their quilts, past and present. Hope to see you all there!